After two ‘really dire’ months in August and September, Derbyshire-based Edward Caudwell of Caudwell & Co in Bakewell (01629 810018) is relishing a late autumn flurry of activity at the upper end of the country-property market. Today sees the launch in Country Life of one of the county’s most appealing historic houses, the Grade II*-listed Palladian Stoke Hall at Calver, in the heart of the Peak District National Park, six miles from Bakewell, at a guide price of £2.75 million through Caudwells and Knight Frank (020- 7829 8171). This is indeed the sale of a lifetime as, were it not for the premature death of its owner who spent 25 years restoring this wonderful house, Stoke Hall would never have come to the market. The hope now is that an equally committed new owner will take over and complete the restoration process. Described by Pevsner as being ‘quite stately’-probably by comparison with its super-stately neighbours Chatsworth and Haddon Hall- Stoke Hall stands in 22.5 acres of gardens, grounds and woodland, overlooking the River Derwent that flows along its eastern boundary. 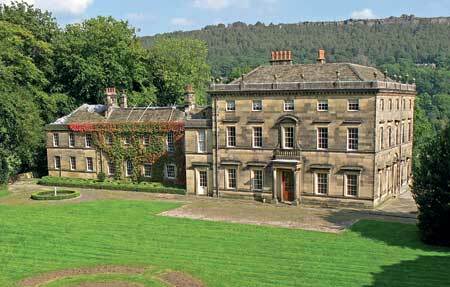 The present house was designed by James Paine and built in about 1757 by William Booth, both of whom were working at Chatsworth about that time. The estate dates from Domesday, although its first known occupant was the Norman Gerbert de Stoke who lived there in 1204. It was then held by the Greys of Codnor before being sold in the 1460s to the Barlows of Barlow Hall; 17th-century owners included William Cavendish, Duke of Newcastle. In the early 18th century, the estate passed to the Rev John Simpson who is thought to have commissioned the present Hall, and it remained in his family before being sold in about 1850 to the Hunter family of Greystones. In the 20th century, Stoke Hall was the home of industrialist Emile Viner, and later a hotel and restaurant, before being sold at auction to the current owners in 1982. The 14,962 sq ft Hall consists of two distinct parts: the main three-storey Georgian house, now largely restored, with its grand reception hall, five elegant reception rooms, kitchen, breakfast room, master suite, five principal bedrooms, two bathrooms and staff apartment, with ample space for more bedrooms and bathrooms; and the older north wing, where the bulk of the outstanding restoration work is needed. In the main house, the exquisite detail of the exterior stonework and fenestration is matched internally by the exuberant Rococo decoration of the walls and ceilings, and the splendid carved panelling of the drawing room-its focal point a chimneypiece by Grinling Gibbons. Built into the hillside to the north-west of the main house is a monumental new motor house with garaging for five cars and a vast underground workshop, designed by the late owner and completed in 2000.